- Publisher In his trademark style, Billy Graham presents the timeless message of salvation. In this modern day classic for the new Christian and for believers seeking to lead others to Christ, this is a foundational guide from the world's greatest evangelist. How to Be Born Again is at once universal and personal, for the new Christian and for the Christian along the way ? an irresistible primer for finding salvation, a guidebook for continuing growth. 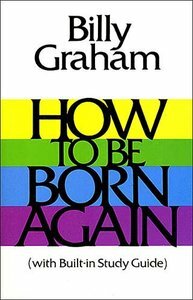 About "How to Be Born Again"
In his trademark style, Billy Graham presents the timeless message of salvation. In this modern day classic for the new Christian and for believers seeking to lead others to Christ, this is a foundational guide from the world's greatest evangelist. Hailed as the world's preacher, the late Billy Graham had a career spanning over half a century. He preached the Gospel to more people in a live-audience format than anyone else in history - more than 210 million people, in more than 185 countries and territories through various meetings, including Mission World and Global Mission. Born William Franklin Graham, Jr. in Charlotte, North Carolina, 17 November 1918, he entered the ministry in 1943 and soon began conducting evangelistic crusades. In 1950, he founded The Billy Graham Evangelistic Association, which has sponsored crusades and produced radio and television programs as well as films. Dr. Graham wrote many books, a number of which became bestsellers. His autobiography, Just As I Am, published in 1997, achieved a "triple crown", appearing simultaneously on the three top best-seller lists in one week. Dr. Graham passed away 21 February 2018.